Now that you have a pipeline, lets add another material to it. Navigate to the new pipeline you created by clicking on the Edit link under the Actions against it. You can also click on the name of the pipeline. Click on the Materials tab. You will notice an existing material . Click on the “Add new material” link. Often you do want to specify a set of files that GoCD should ignore when it checks for changes. Repository changesets which contain only these files will not automatically trigger a pipeline. These are detailed in the ignore section of the configuration reference. There are cases where instead of ignoring those files or folder/s, you want GoCD to consider only the specified files or folders when checking for changes and ignore the rest. 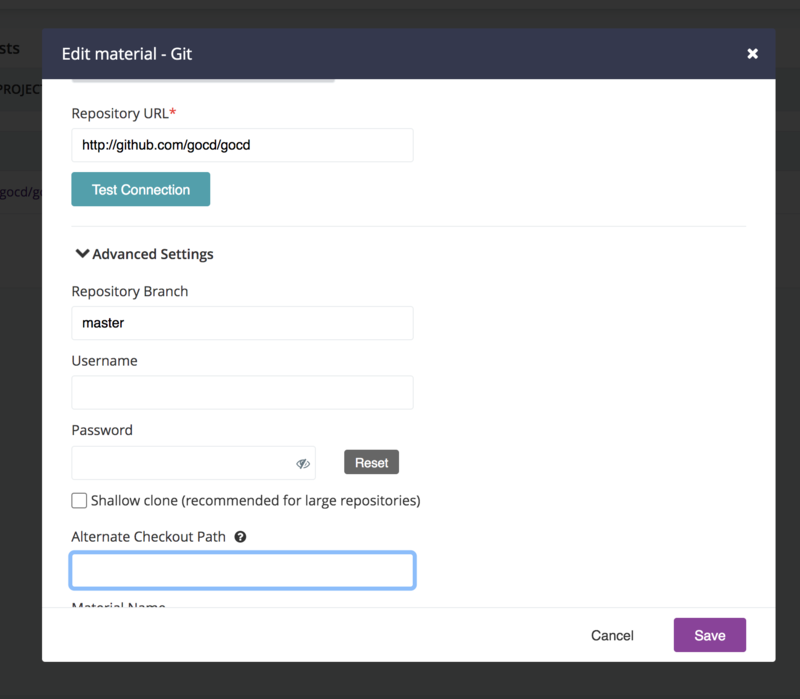 With GoCD whitelisting, you can allow a pipeline to trigger on certain repository changesets. Note - GoCD uses '**' for folder/path and '*' for files. Ignore everything under the folder ‘doc’, even deeper levels of subfolders/files under doc folder. Ignore files under the folder ‘doc’, excluding any subfolder. Ignore files that are under the directory ‘framework/helper’ and the file extension is .doc. Ignore files that are under the root directory of SCM repository and the file extension is .pdf. Ignore all the files that is under any ‘helper’ folder and the file extension is .pdf. Ignore all the files that are in the nested directory under folder ‘helper’ of the repository and the file extension is .pdf.